You may see other aircraft on a stick in Pensacola, but this one is special. 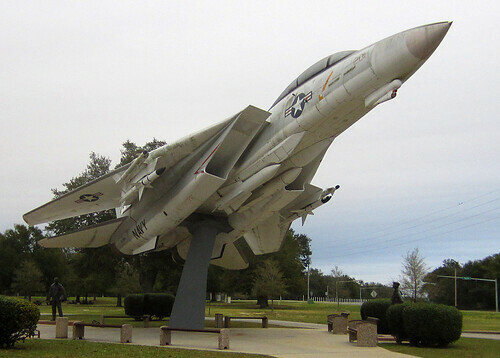 The fifth Grumman F-14 produced stand proudly in front of the National Museum of Navy Aviation in Pensacola. 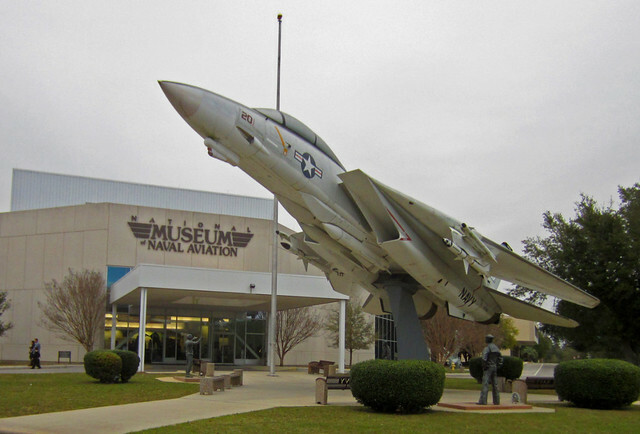 Anyone interested in airplanes should plan on devoting a full day to visit this museum. 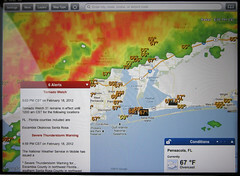 If you are traveling on I-10, it is only about 15 miles to the south, via exit 7. You will have to enter the Naval Air Station so don't panic when you cross the bridge and find yourself headed into a military base. 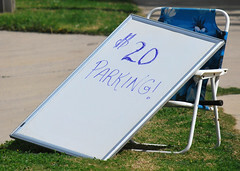 All the driver will need to do is show his driver's license to gain access to the base. The initial flight of an F-14 was in December of 1970 and more than 700 were built. You can probably find one on display near you, even if you are not in Florida. Here is a view from the opposite side. For more on the F-14, read through the Wikipedia entry. 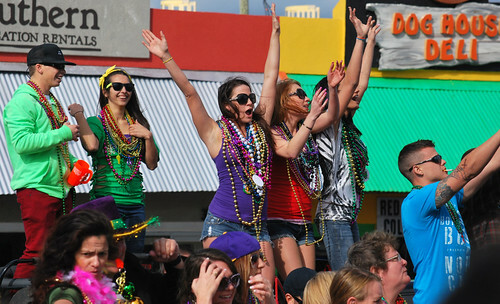 Today's major event in our lives was the Panama Beach Mardi Gras parade. 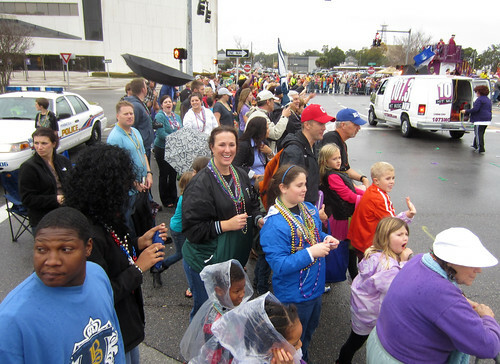 Now the easiest way to experience the parade will be for you to just watch this two minute YouTube video. Or maybe this four minute YouTube video. 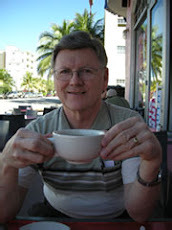 But, of course, I am going to show you pictures too. 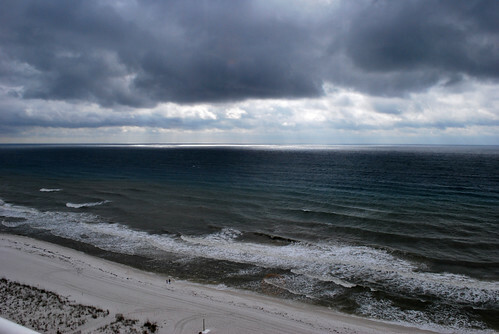 When I got up and looked out the window, the weather didn't look very cooperative. 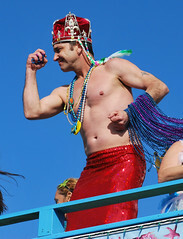 At Mass, Father Paul mentioned Mardi Gras and the parade, even explaining the origins of Carnival, "the meat goes away" - he checked it out on Wikipedia. Well, Fr. 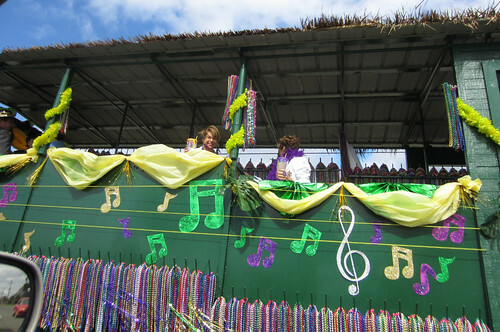 Paul noting the importance of the parade to many of us took care of the weather problem. By the time I got home we had blue skies and sunshine. Getting home wasn't easy. I encountered my first traffic jam on the island. 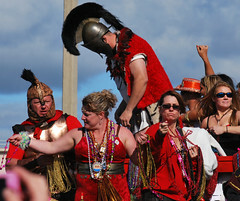 There is really only one road that runs the length of the island and it is the parade route. 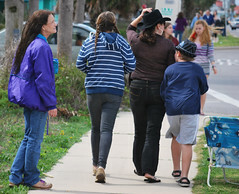 While it was only 11 a.m. and that was three hours before the parade starts, the krewes were lining up and socializing. As the sign says, "Let the Good Times Roll!" 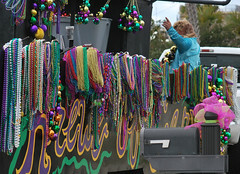 Linda and I went out for a walk to check the parade route and preparations at around noon. Parking was becoming tight. These fellows all had parked their trucks across the street the previous night for front row seating. 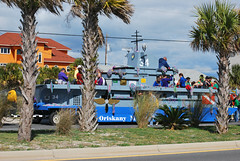 We saw several floats that were familiar from yesterday's parade, but this aircraft carrier was a new addition. The sign above the flight deck looked pretty authentic. 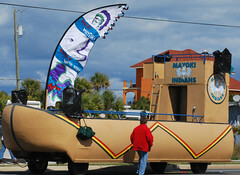 I think this qualified as the biggest car in the parade. 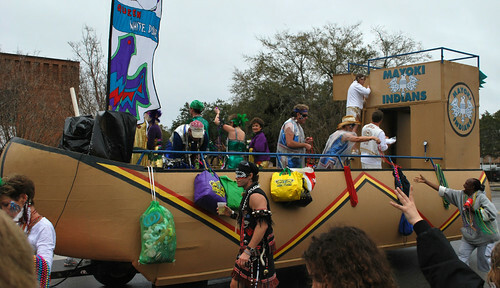 Krewe du Ya Ya was getting ready. 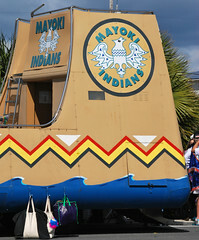 And the Mayoki Indians were back, this time with two floats. 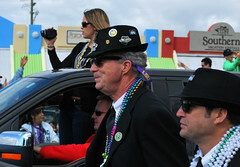 Everyone seemed to have plenty of beads and plenty of horsepower. 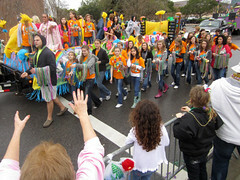 The parade started promptly at 2 p.m. We all raised our hands and started fighting for the throws. 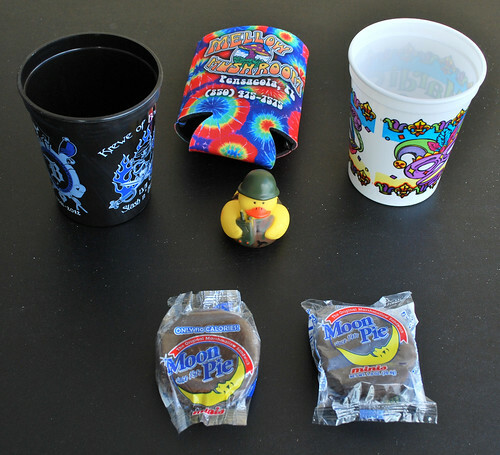 The Krewes rolled and threw. 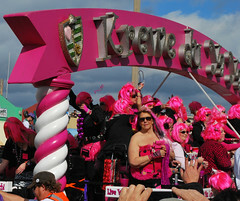 Krewe du Ya Ya had the most color. 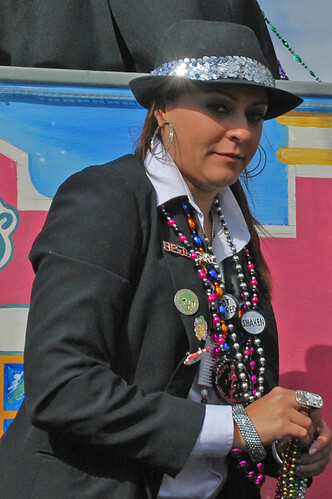 The Blues Brothers had the most black and white. These two guys had Jake and Elwood down pat. This Blues Sister had an eye for the camera. 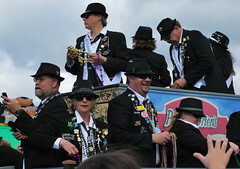 There were quite a few interesting individuals among the krewes. 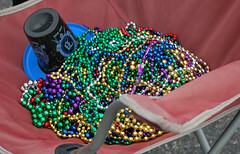 By this time, everyone had collected quite a few beads and other throws. 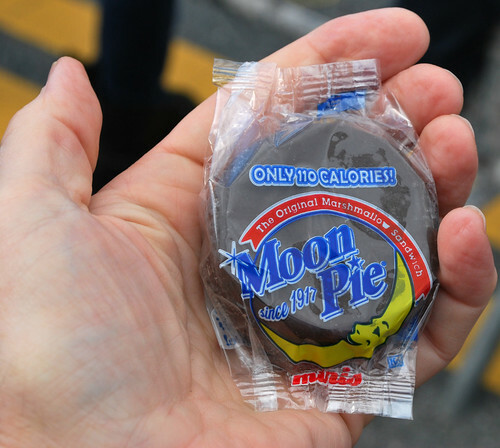 In case you were unfamiliar with the "Moon Pie" that I mentioned yesterday, I picked one out of the air to show you today. There were a couple of different techniques in play to try for extra advantage. One fellow brought along a ladder. Surprisingly, he didn't seem to sustain any major injury. Another watcher had brought along her windshield snow scraper. She used it to considerable advantage along the barrier. Now. 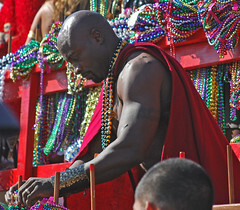 What do you do with all these beads? You can wear them, bag them or just put them in a pile. 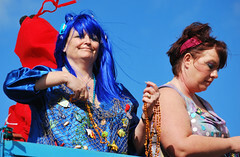 We didn't do nearly as well as the more experienced hands but did bring back a few items in addition to beads. Frankly I'm happy that the fellow next to me caught the bag of Ramen noodles. 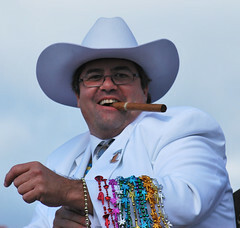 Mardi Gras is a big celebration in the southern states. 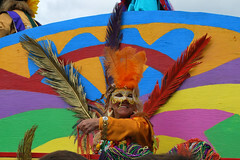 It is not just a New Orleans festival. 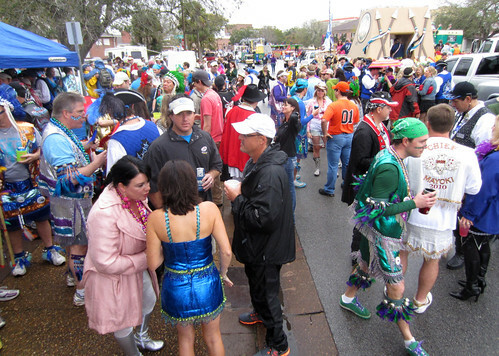 And most towns don't celebrate it the way you imagine if you are familiar with the New Orleans party! 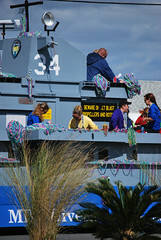 Pensacola's celebration extends for several weeks. 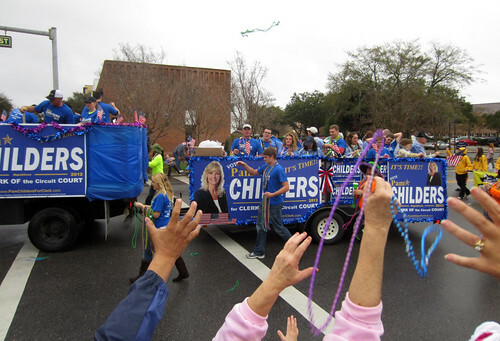 But with the parade scheduled to start at 2:00 p.m. we headed over to Pensacola and took up a position at Spring and Garden near the beginning of the parade route. 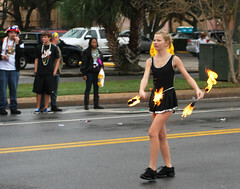 People were joining up with their krews and the parade began on time under gray skies but with only very light rain. 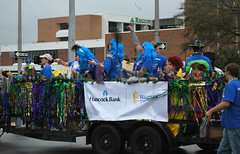 Participants in the parade really only have one responsibility - they have to throw something. 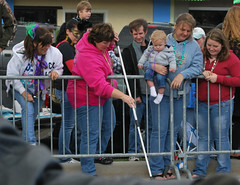 Spectators catch. 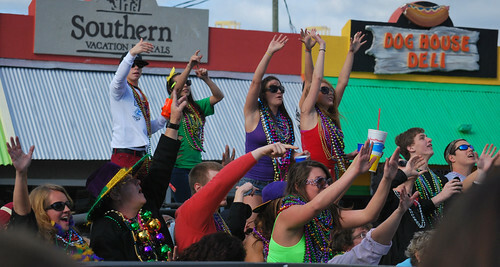 Here you see a lot of outstretched hands from the spectators. 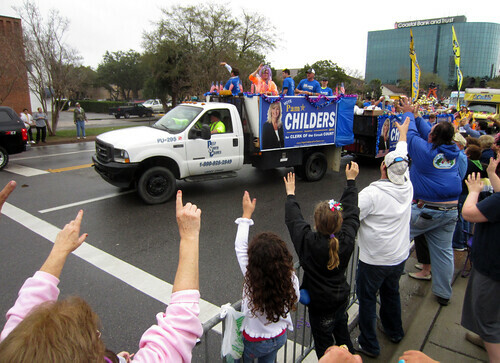 Notice that the politicians never miss a parade. 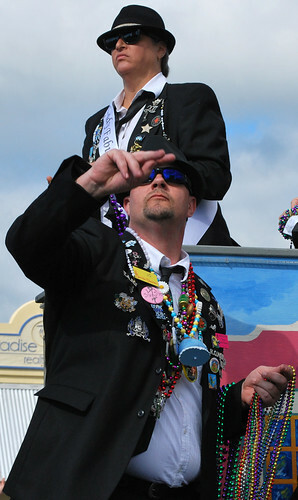 In this picture, you should see several sets of beads in flight. 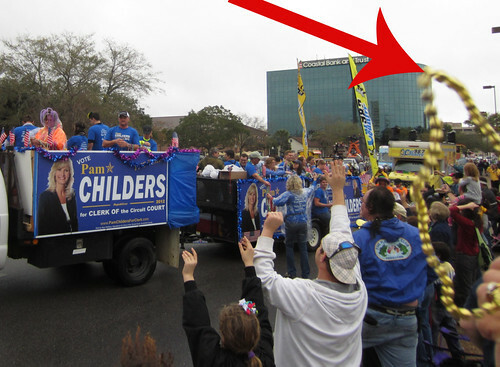 Linda is catching this set of gold beads. 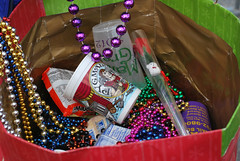 Other things thrown are candy, can-insulators, Moon Pies and an occasional teddy-bear. Here goes some candy! 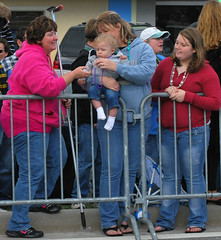 This is a family affair so the marchers come in all ages. And political correctness hasn't dampened the spirit of this mythical Indian tribe. 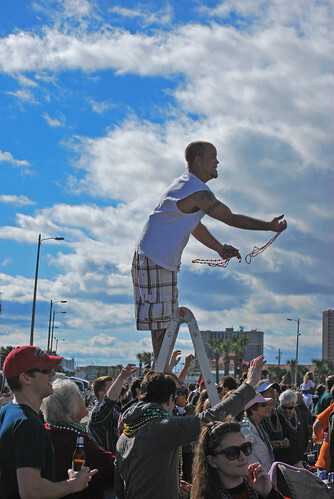 By the time a half hour had passed, most people had caught at least a few beads. 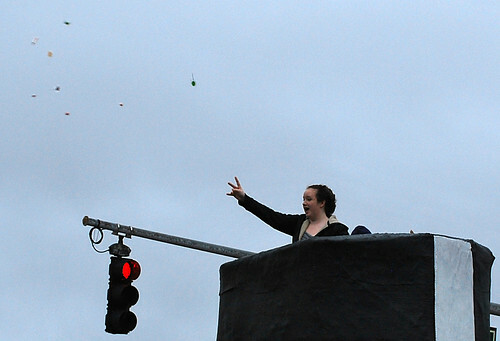 But the rain was starting to come down a little harder. 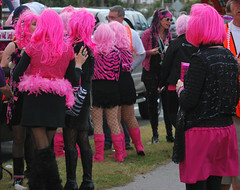 I had enough pictures and there is another parade here on the beach tomorrow. We left early. 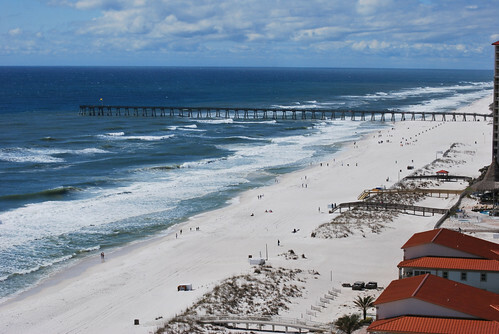 A Tall Bottle of Coca-Cola, Fort Walton Beach.